In sixth grade, I made a series of cartoons in Microsoft PowerPoint featuring a flamingo on an island similar to the one in the blog header. By changing the settings so the slideshow automatically advances, it’s possible to animate objects like a sort of digital flip book. True, the rest of the world uses PowerPoint for board meetings and sales pitches, but I’ve always seen it as a graphic design tool. This difference in approach is a help and a hindrance. During the CNET sales pitch-off, my presentation was awesome. There were little animated transitions, objects moved about the screen as text popped in and out, the CNET “redball” logo spun around the screen. It was a hit. But how often are spinning logos necessary? Never. The risk of distraction outweighs the cool factor. Worse though, is my fascination with PowerPoint and continuing to use it as my go-to for all things graphic design has stunted my growth in learning programs better suited for graphic design. Liam would animate with Photoshop and Flash occasionally. He made equally sophomoric cartoons, but he could easily post them on the web. I still manipulate images with PowerPoint and Microsoft Paint (Yeah. Paint.). I enjoy the scrappiness of the tools, but it’s less than ideal. I’ve volunteered to put together the slideshow to introduce the new volunteers to those who are currently here. At the welcome celebration for group 82, we’ll show pictures of groups 79, 80, and 81, calling out each member and showing funny/embarrassing/endearing photos of that person. In the past this has been a rather straightforward slideshow; that is, the person’s name and picture on a slide then another person’s name and their picture on the next slide. The cooler, flossier slideshow is the one shown at the All Volunteer Conference at the end of November (Jenny 80 is doing this year’s.). I see so much possibility here. Rarely do I get the chance to innovate and surprise. I can pimp this slideshow. More than that, I will enjoy pimping the slideshow. I can bury my head in PowerPoint for hours and have a grand old time. 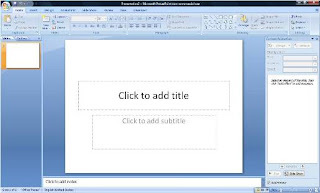 Part of the reason I can’t get past PowerPoint is because I enjoy it so much. But I also feel like it’s an opportunity to grow. Over the last 10 months I’ve found a lot of satisfaction in trying new things and reaching outside my comfort zone. Maybe I should seek out better ways to do this. Maybe I should reach for real software that has tools designed to do the things I want to do rather than trying to re-purpose awkward software intended for corporate minions. Maybe it’s time to hurl the hammer through the PowerPoint slideshow. Perhaps it’s time to think different. Perhaps it’s time to get a Mac. I’ll just have to wait until downtown Apia gets an Apple Store. Still life. 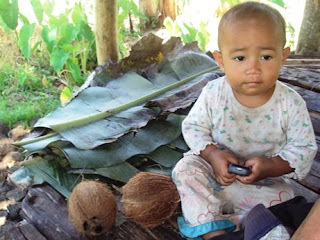 Baby clutching cell phone next to coconuts. Akanese and Keleme on their side of the makeshift seesaw (i.e. fallen palm tree) at the maumaga. 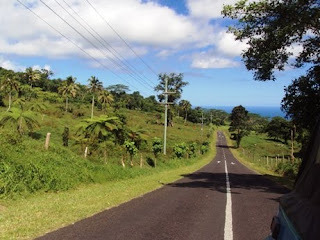 The view from the top of the Cross Island Road. You can see the ocean in the distance. With the Road Switch, it seems like the most difficult part is being a pedestrian. 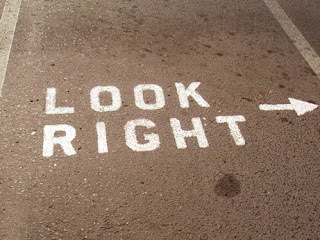 These words have been sprayed in crosswalks all over town. Clearly I'm not the only one who's having a tough time. 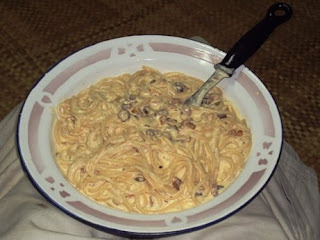 Cale made spaghetti carbonara last night. It was amazing. You really ought to look into the Micrcosoft MCSE certification program - even if you're thinking Apple. You might be able to do the courses remotely through Ohlone College since most classes are offered online. Let me know if you're interested. I reckon something creative in the arts, you know like animation, video game graphics (but with an educational angle) or get to Hollywood..Holler!! and work on TV stuff.. It sounds like you are just as excited about these new volunteers coming as they probably are at finally arriving as well. They will be warmly welcomed I bet! "once you go Mac, you'll never go back"!